CrowdEquality is aimed at collecting ideas and triggering discussions about promising initiatives for promoting gender equality and diversity and improving work-family balance in research institutions. CrowdEquality strives to be an inclusive community that empowers men and women all over the world to freely discuss the issues of gender equality in research institutions. CrowdEquality is designed to connect academic and non-academic staff members working at research institutions, policy makers, gender experts, members of relevant NGOs (Non-Governmental Organisations) and national/international networks, as well as all individuals interested in the design and implementation of Gender Equality Plans (GEPs). CrowdEquality was developed by the team of eight Bachelor students studying Information Systems at the University of Münster (WWU) as part of their project seminar in October 2016 – February 2017. Afterwards the platform was thoroughly tested and further improved by the Working Group members of the EQUAL-IST project at the WWU. 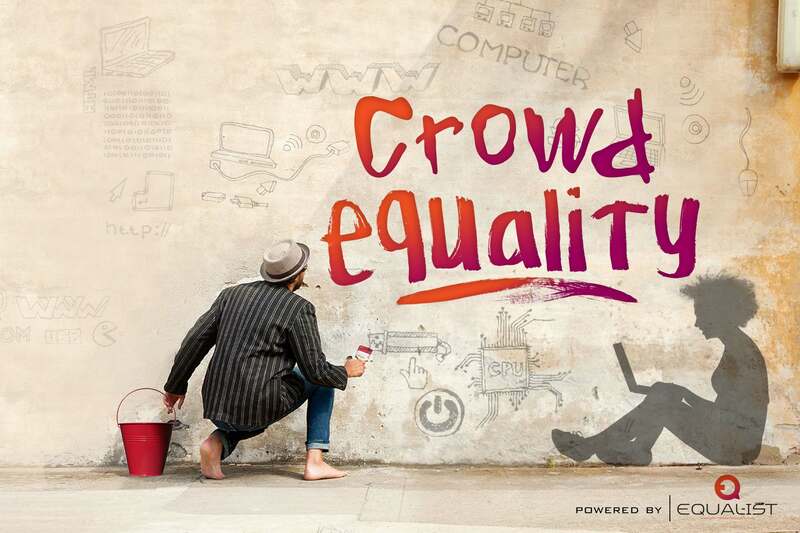 Within the EQUAL-IST project the CrowdEquality platform acted as a central means for participatory co-design of tailored GEPs. The platform most active phase took place in March – June 2017, when the students and staff members of the 7 research institutions participating in the EQUAL-IST project (Research Performing Organisations, RPOs), as well as external users, had an opportunity to contribute to the platform. The platform supported the collection, dissemination, and discussion of (1) the specific challenges related to gender equality, diversity, and work-family balance (hereinafter referred to as “the challenges”) that each RPO faced, as well as (2) the promising initiatives to address each of the identified challenge (hereinafter referred to as “the ideas”). During the Ideation phase (April – May 2017), the challenges and potential ideas to address them were collected on the platform. During the Voting phase (May-June 2017), the users could vote on the (pre-selected) feasible ideas. As a next step, RPOs developed action plans for implementation of the winning ideas, i.e. for those ideas that received the highest number of up-votes and the lowest number of down-votes. The developed action plans then formed the core of the tailored GEPs, which are currently being implemented by RPOs. All personal data collected on the platform is stored in a secure way on the server of the Department of Information Systems at the WWU (the Department). Personal data might be displayed only if a user did not mark is as anonymous and only in the private area of the platform, which is accessible only to registered and logged-in contributors. Personal data will be anonymised before it is made available to any third party (inside or outside the European Union). Please see the “Terms and Conditions” section on the platform for further details. The platform will be maintained by the Department until the completion of the EQUAL-IST project (May 2019) and will remain in the static mode for at least three years afterwards. The initial steps of the platform implementation were published in the proceedings of the 25th European Conference on Information Systems (ECIS 2017). The research article reported on the results of (1) a systematic literature review of academic studies discussing how gender equality can be promoted with the help of IT-enabled idea crowdsourcing, (2) a market analysis of existing idea crowdsourcing platforms, and (3) the collection and analysis of requirements to the idea crowdsourcing platform aimed at the promotion of gender equality in IT research institutions (i.e., the requirements to the CrowdEquality platform). Please see the paper full text for further details. In the “Executive Summary” section the platform goals and relevant links are introduced. In the “Overview of the CrowdEquality Platform” section the platform technical basis (the Drupal Content Management System) is clarified, followed by the introduction and explanation of all platform webpages with respective screenshots. Appendix contains the final list of requirements to the platform, followed by the extensive platform technical documentation. The explanation of the platform purpose and how to use it is also published on the platform “About” section and is included in the text of the automatic emails sent to the platform users upon their registration.